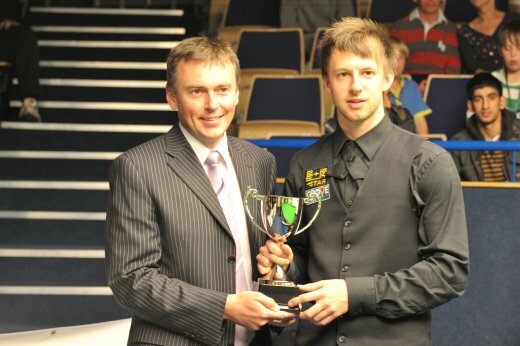 The Grove’s Judd Trump has won the final of the second PTC event after beating Ding Junhui 4-0 in the final. Judd was back to winning ways with a 4-2 win against Justin Astley and 4-2 wins against Mark Allen and Mark Davis to reach the last eight. He then came up against Neil Robertson and won a tense match 4-3 on the black ball, making the highest tournament break to date during that match with a 141. Judd then met fellow Grove player Yu Delu in the last eight and ran out the winner, 4-1 and followed this up with a very swift 4-0 win against Fergal O’Brien in the semi final. Judd was even quicker in the final against Ding Junhui. Unlike the World Championship semi final there was no marathon match this time, with Judd rattling off the 4 frames needed in just 41 minutes. All seven Grove players were back in action at the second PTC event, this time taking place at the South West Snooker Academy. Ronnie O’Sullivan also made it through to the last 8 with wins over Nick Jennings 4-1, Stephen Hendry 4-1, Matthew Stevens 4-3 and Liam Highfield 4-3 but then lost to Fergal O’Brien 3-4 in the quarter final. Yu Delu enjoyed his best run to date on his first season on the Main Tour, with a win over fellow Grove player Matthew Selt 4-3 in round one followed by victories over Joe Jogia 4-2, Patrick Wallace 4-3 and Adam Duffy 4-3 before his defeat against Judd. Grove Amatuer Chen Zhe made it through two qualifying rounds again with wins over Grzegorz Biernadski of Poland 4-1, and Brian Cox 4-0 (including a 100 break) but then came up against Neil Robertson in the first round proper and lost 0-4. Sadly Liu Song lost in round one to Sam Baird 3-4, Jack Lisowski lost 1-4 in the same round to Ireland’s David Morris and Zhang Anda lost in the first qualifying round to George Marter 3-4.